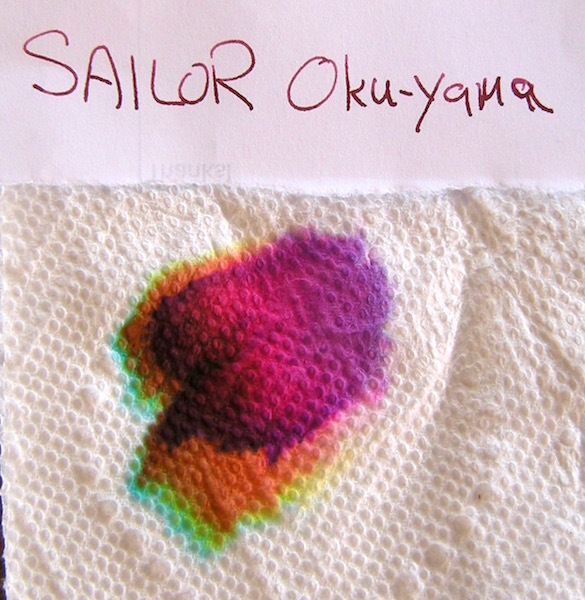 Anyone checking my various reviews knows Sailor is probably at the top of my list of favorite inks. 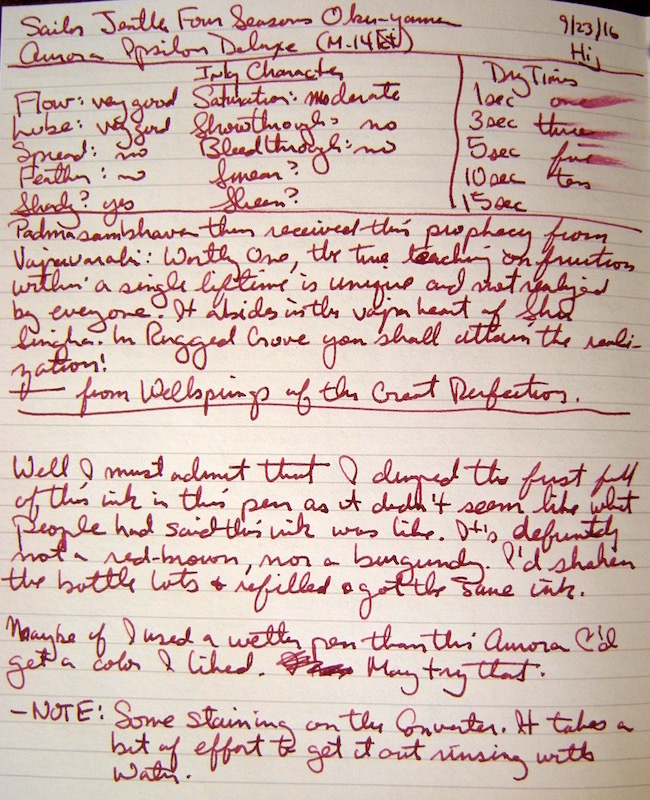 But you may also know that red inks are my least favorite ink color. 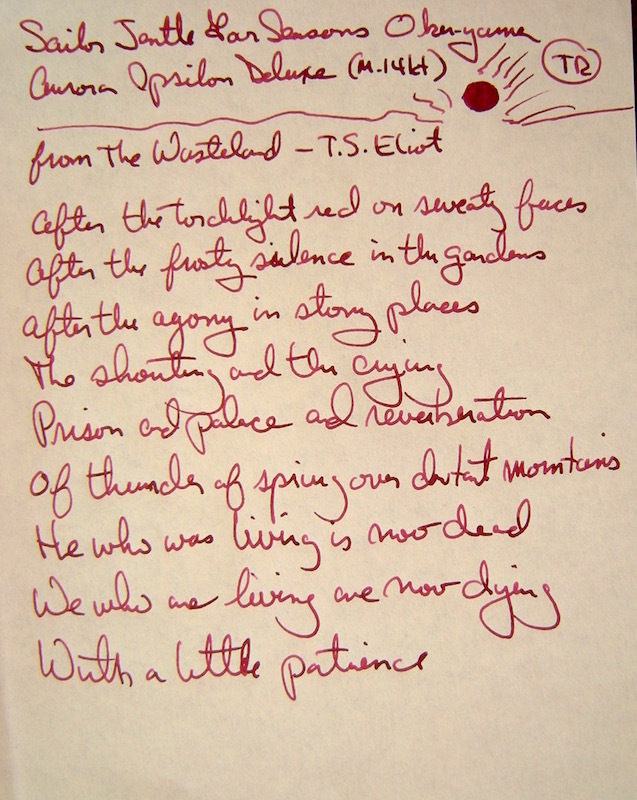 So I avoided this particular ink when it was re-issued in 2014 I think as part of the "Four Seasons" line-up. This is not a "limited edition" ink in any way, but part of the regular line, which Sailor is recently expanding. I bought this particular bottle at Fountain Pen Hospital in NYC last month. The manufacture date stamp on the box is September 2015. I saw some reviews and thought it might be good to have this ink. 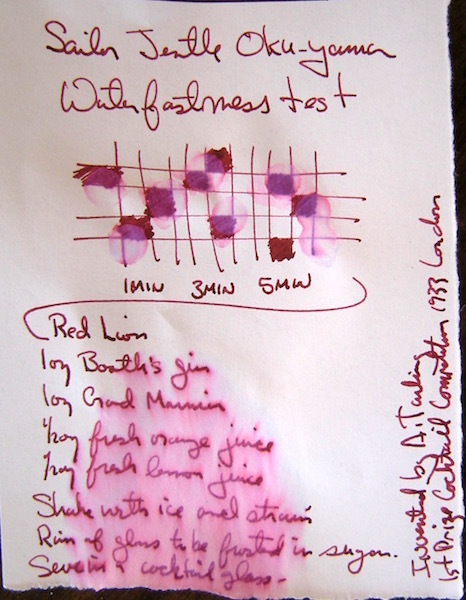 Burgundy colored inks I can like, especially dark ones line Sailor Pen & Message Old Burgundy. 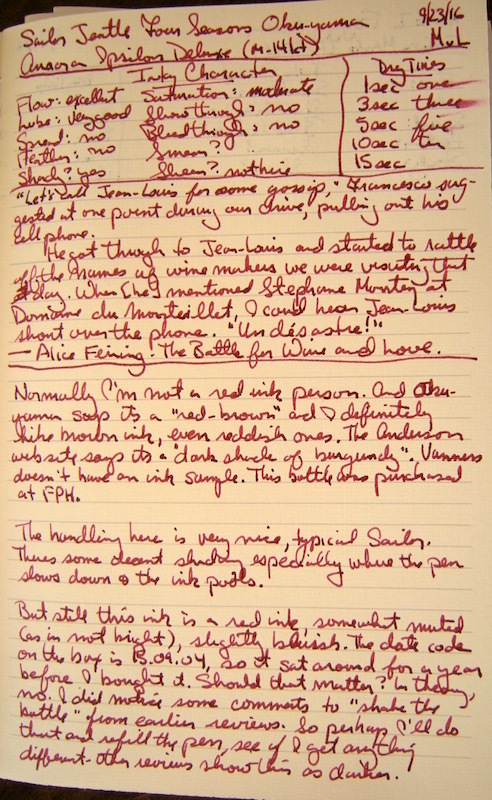 Anderson Pens called this ink a burgundy. Vanness calls it a magenta. I say it looks like a muted red that leans blue. And it looks nothing like the images on FPN in the reviews. Well that may be an exaggeration, but it's not as dark, and definitely not burgundy. Maybe if I'd used a wetter pen I'd have gotten different results, at least more dark red. Personally I wouldn't want to write a page of dense text with this ink. It might be suitable for correction, or marginalia. Maybe with a fancy nib you could get some special invitations written. The ink handles perfectly fine, just like nearly all Sailor inks. Just not a color for me. I probably could learn to like it, but the moment I'd write with another color I'd loose interest in this one. You may well feel differently, and if so, I hope you enjoy this ink. The usual paper suspects for me: Mohawk via Linen=MvL, Tomoe River=TR, Hammermill 28 ln inkjet=Hij. NOTE: Stains the converter lightly. Takes a bit of rinsing to remove it, but it does come off with just water. Not super waterfast. Washes away pink. A very interesting ink drop on the wet paper towel. Thanks for the great review. Although I may have to pass on it as well. I don't get a lot of use out of these brighter red shades. Still, I wish I could come up with an excuse to pick up a bottle. Edited by Kanayama, 28 September 2016 - 10:03. It is difficult for me to find a good red I like. Right now, I'm only favorable to Iroshizuku Momiji and Diamine Matador. Thanks for the review. If I didn't already have this ink I'd buy it just for the chroma!